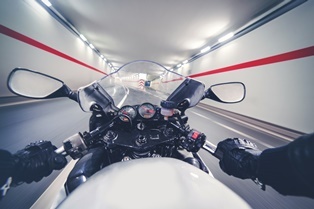 Riding a motorcycle can be inherently dangerous, in part, because motorcycles lack the steely exterior that cars, trucks, and other passenger vehicles enjoy. Even the most safety-conscious motorcyclist face a greater risk of injury than the average motorist because there's just not much standing between them and the road. Unfortunately, when you add high-performance "supersport" motorcycles to the equation, things can quickly go from bad to worse. Featuring lightweight, powerful engines, supersport motorcycles are racing motorcycles that have been modified for highway use and sold to the public, often to consumers who lack the training necessary to ride them safely. Capable of reaching speeds of up to 190 miles per hour, supersport motorcycles are particularly popular with motorcyclists under age 30. The souped-up motorcycles have a concerning rider death rate that's nearly four times higher than that of other types of motorcycles and, despite accounting for only 10 percent of the motorcycles in the United States, are involved in 25 percent of all fatal motorcycle accidents. In spite of all the dangers and risks associated with riding supersport motorcycles, not all accidents involving these bikes are caused by rider error. Motorcyclists injured in crashes caused by another motorist's negligence are well within their legal rights to pursue compensation for damages from the at-fault party, regardless of whether the motorcycle they were riding at the time of the accident is statistically considered particularly perilous. While not all supersport motorcycle accidents are caused by rider error, many are. In fact, rider error is a leading cause of these types of accidents, as is speeding. According to the Insurance Institute for Highway Safety's (IIHS) Highway Loss Data Institute (HLDI), excessive speed was cited as a factor in 57 percent of supersport riders' fatal crashes, compared to 27 percent of fatal crashes involving riders on cruiser and standard motorcycles, and 22 percent of fatal crashes of riders on touring motorcycles. Alcohol also plays a role in fatal supersport motorcycle accidents though, surprisingly, at a lower rate than it does in fatal accidents involving motorcyclists who ride cruisers, standard bikes, and touring motorcycles. Alcohol impairment is a factor in approximately 19 percent of fatal supersport motorcycle crashes, 33 percent of fatal cruiser or standard motorcycle crashes, and 26 percent of fatal touring motorcycle crashes. In additional to the physical suffering caused by these injuries, they can also cause significant ongoing mental and emotional distress, such as depression, anxiety, and post-traumatic stress syndrome (PTSD). Supersport motorcycles are not the only high-performance motorcycles on the road today. Sport motorcycles are another type of high-performance motorcycle that's particularly popular with the younger demographic (riders under the age of 34). These motorcycles have a lower power-to-weight ratio than their supersport counterparts but are otherwise similar. Whereas the death rate for riders of supersport motorcycles is four times that of riders of traditional motorcycles, the death rate for sport motorcycle riders is two times that of regular motorcycle riders. Speeding is a factor in 46 percent of fatal sport motorcycle accidents and alcohol is involved in 23 percent of these crashes. Were You Injured in a Supersport Motorcycle Accident?